I have not been convinced about the claims coming from Turkey and from the Washington Post and others regarding the allegations of a gruesome murder of intelligence asset, Jamal Khashoggi, in October, 2018. There are too many anomalies as it was portrayed by various statements from Turkey President Erdogan, and echoed by a chorus of the Western mainstream media. 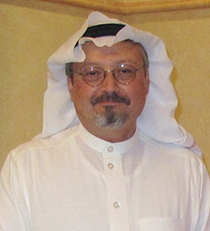 Recent research suggests that perhaps Khashoggi was never in that Saudi Consulate in Istanbul that day, and in fact may still be quite alive and in hiding. If so, it suggests a far larger story behind the affair. Let’s consider the following . Saffuri is also the protégé of al-Qaeda fundraiser Abdurahman Alamoudi, reportedly also an influential Muslim Brotherhood supporter who before 2004 met with both G.W. Bush and Hillary Clinton. Alamoudi is currently in US federal prison since 2004 for his role as bagman for a Libyan/Al-Qaeda assassination plot to assassinate then- Saudi Crown Prince Abdullah. In brief, the prime sources on the Khashoggi murder are few and hardly without bias.